“I haven’t been so moved by a book in a long time. For various reasons, it couldn’t have been written earlier. It’s personal and political, intimate and artful… This book should become a classic.” – Gene Kerrigan, Sunday Independent. “Fascinating…an intriguing insider account of a campaign that won plaudits from Nelson Mandela and Archbishop Desmond Tutu.” – The Irish Independent. The book isn’t simply about the strike, or a battle with Dunnes Stores management, it’s about a group of young retail workers taking on the entire Irish Establishment… and winning. It’s the story of a very public political campaign, mixed with a deeply personal story. Of triumph and tragedy. Of sacrifice and success. But mostly about the selflessness of a small group of Irish working class activists. When Mary Manning and her colleagues in Dunnes Stores on Henry Street were issued a directive by their trade union IDATU (now Mandate Trade Union) not to handle South African goods, the workers knew very little about the struggle of impoverished black South Africans. Nevertheless, they weren’t going to ignore their union’s directive. Mary Manning was first to be tested. A young woman approached her till with Outspan grapefruits and Mary explained how she could not handle the goods the customer had presented because of a union directive. The customer had no issue with this, but management did. 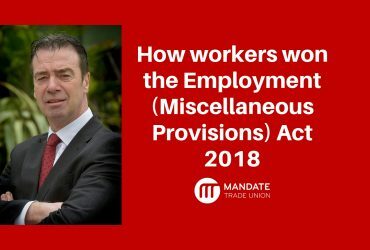 This simple action would ignite the highest profile Irish trade union dispute in decades. 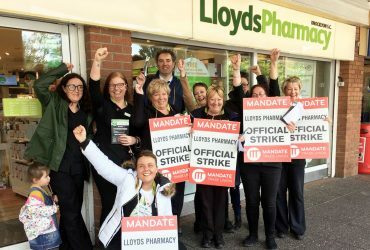 When Mary was suspended for her action, shop steward Karen Gearon announced a walkout, with only eight other workers joining Mary and Karen on the picket line (Tommy Davis, Liz Deasy, Michelle Gavin, Sandra Griffin, Theresa Mooney, Vonnie Munroe, Cathryn O’Reilly and Alma Russell). The strikers were aged 17 to 24 years of age, and at first it was thought the whole affair would only last a few days, but almost three years later, the workers still stood their ground. Striking Back details the milestones along the way. How, when the workers learned how the black South Africans were treated by the minority white population; how they were routinely murdered or declared missing; how they couldn’t vote; own property; or vindicate the most basic of human rights; they could never go back to handling South African produce. Mary’s book illustrates a small number of heroes along the way, including the late Mandate Trade Union official Brendan Archbold, who stood by the workers through thick and thin. And Nimrod Sejake, a black South African who could not return to his homeland because he would face the death penalty – yet stood on the picket lines throughout the strike giving counsel, educating the strikers and helping them to strategise and build their movement. Then there are the villains. The Dunnes Stores management who went to extreme lengths to make life difficult for the workers, who tried to humilate them, who turned a blind eye as former “colleagues” of the strikers threw food out of upstairs windows at the workers as they took their brave stance. The gardai who routinely harrassed the workers, calling them “n***er lovers”, who beat them up, followed them home and called to their family homes to intimidate them. The Catholic Church who publicly condemned the strikers, with a group of nuns passing the picket in order to incite the picketers. The politicians who took no actions to protect the workers for years, who left them on the picket lines for two years and nine months until they were embarrassed by the international attention the action was receiving. The workers’ own union executive who ordered the workers off the picket lines at a crucial stage in the dispute. And surprisingly, the Irish Anti-Apartheid Movement leader Kader Asmal, who undermined the actions of the workers. It was only when Archbishop Desmond Tutu was awarded the Nobel Peace Prize in 1984 and requested the Dunnes strikers attend his press conference in London that public opinion and attitudes in Ireland changed. Nelson Mandela, after being released from 27 years in prison, visited the strikers in Dublin to personally thank them for their actions, but the fallout for Mary Manning was to continue. She couldn’t find any jobs in Dublin because her name was synonymous with the strike, so she had exiled herself to Australia for five years, missing out on meeting one of her heroes, while also missing the funeral of her father. Towards the end of the book, Mary thanks Mandate Trade Union for sending her and the other strikers to Nelson Mandela’s funeral in 2013, giving them a particular sort of closure on that chapter in their lives: “Incredibly, Mandate agreed to pay for all the remaining flights and accommodation for our 10-day stay in South Africa. “I think we all felt that this huge act of generosity was the union’s way of letting us know that, while the union Executive Committee of the 1980s had failed us, the present day Executive would not. This book is essential reading for all trade unionists and activists. 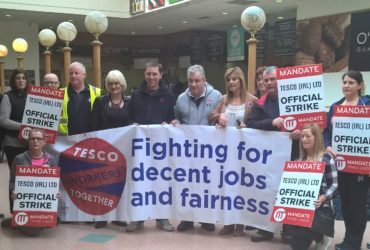 It successfully illustrates the Dunnes Stores strikers’ belief that power comes from the bottom, and with determination, solidarity and persistance, anything can be achieved. It is an honest portrayal of one of Ireland’s longest and most inspiring strikes, exposing the class bias and viciousness of Ireland’s Establishment. It’s an emotional rollercoaster highlighting the impact an action like this can have on not only you, but those closest to you. It also shows how the Catholic Church and the Irish Establishment have terrified ordinary decent citizens into paralysis on matters of concience. But most of all, it’s the story of a serendipitous coming together of a small number of extraordinary retail assistants in Dunnes Stores on Henry Street in Dublin who went on strike in solidarity with millions of black South Africans they had never met. And how those working class heroes helped millions of oppressed black people overcome the vicious and murderous apartheid regime. Striking Back by Mary Manning can be purchased at most good book stores in Ireland. You can reserve/purchase it on the Easons website.